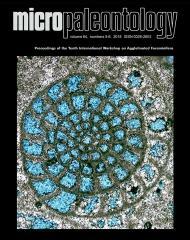 ABSTRACT: Micropaleontological biozonation of the Jurassic of the Middle East is poorly developed and shown to have limited regional applicability. This difficulty is based on the inability to apply global schemes based on open marine forms, such as planktonic foraminifera and calpionellids, to the extensive and relatively shallow, often hypersaline carbonate platforms that persisted throughout much of the Jurassic. Intrashelf basins with restricted open marine access further inhibited the use of standard global tropical planktonic biozonations. The Arabian Platform was a shallow marine, predominantly carbonate, setting during most of the Jurassic and peri-Tethyan age-indicative foraminiferal species are relatively poorly represented. Pioneer fieldwork established chronostratigraphic constraint to the various Jurassic formations and members, using ammonite and nautiloid stratigraphy but such macropaleontological schemes are impossible to use in subsurface-derived limited rock sample volumes such as those from cuttings, sidewall cores and cores of lithified carbonates. A thin-section reassessment of the Saudi Arabian Jurassic using field samples and core-based micropaleontology has revealed a hybrid benthic foraminiferal and microfossil bioevent scheme that should assist assignment to the various formations, members and reservoirs as well as assisting in paleoenvironmental interpretation. Twenty-three thin-section based local biozones (Him-3â€“Mm) are proposed, and serve as an initial scheme with an alphanumeric arrangement to permit refinement when additional events are encountered. These biozones are applied to the Marrat Formation (Mm; Toarcian), the Dhruma Formation (Dm-1 to Dm-6; Bajocianâ€“Bathonian), the Tuwaiq Mountain Formation (Tm-1 to Tm-5; Callovian), the Hanifa Formation (Hm-1 to Hm-2; Oxfordian), the Jubaila Formation (Jm-1 to Jm-2; Kimmeridgian), Arab Formation (Am-1 to Am-4; Kimmeridgian), and Hith Formation (Him-1 to Him-3; Tithonian). In the absence of other disciplines, this scheme is intended to assist chronostratigraphic and lithostratigraphic assignment to field samples and for exploration single well studies to provide calibration and correlation for multiwell single field and regional reservoir characterisation studies. Rapid age and lithostratigraphic determinations of â€œhot-shotâ€ exploration samples will also be facilitated using this scheme.